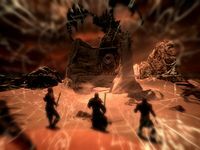 Exploit the Time-Wound to learn Dragonrend and defeat Alduin at the Throat of the World. Read the Elder Scroll at the Throat of the World. Learn how to use the Dragonrend shout. As soon as you claim the Elder Scroll from the Tower of Mzark, this quest starts and points you back to the Throat of the World where Paarthurnax awaits. Exit the tower by using the lift to the east and pull the handle on the surface, thus providing yet another shortcut to Blackreach. You will find yourself a long way from Alftand where you initially entered and may wish to loot the abandoned camp just outside the tower entrance. Travel back to the Throat of the World and Paarthurnax will be quite impressed with your efforts: "You have it. The Kel - the Elder Scroll. Tiid kreh... qalos. Time shudders at its touch. There is no question. You are doom-driven. Kogaan Akatosh. The very bones of the earths are at your disposal. Go then. Fulfill your destiny. Take the Scroll to the Time-Wound. Do not delay. Alduin will be coming. He cannot miss the signs." "Know that Gormlaith sent you down to death!" "Which is why I brought the Elder Scroll." Hakon: "Gormlaith! We're running out of time! The battle..."
Dragon: "Daar sul thur se Alduin vokrii. Today Alduin's lordship will be restored. But I honor your courage. Krif voth ahkrin. Die now, in vain." Gormlaith: (joins the attack and kills the dragon) "Know that Gormlaith sent you down to death!" Gormlaith: "Hakon! A glorious day, is it not!" Hakon: "Have you no thought beyond the blooding of your blade?" Gormlaith: "What else is there?" Hakon: "The battle below goes ill. If Alduin does not rise to our challenge, I fear all may be lost." Gormlaith: "You worry too much, brother. Victory will be ours." Hakon: (To Felldir) "Why does Alduin hang back? We've staked everything on this plan of yours, old man." Felldir: "He will come. He cannot ignore our defiance. And why should he fear us, even now?" Gormlaith: "We've bloodied him well. Four of his kin have fallen to my blade alone this day." Felldir: "But none have yet stood against Alduin himself. Galthor, Sorri, Birkir..."
Gormlaith: "They did not have Dragonrend. Once we bring him down, I promise I will have his head." Felldir: "You do not understand. Alduin cannot be slain like a lesser dragon. He is beyond our strength. Which is why I brought the Elder Scroll." Hakon: "Felldir! We agreed not to use it!" Felldir: "I never agreed. And if you are right, I will not need it." Hakon: "No. We will deal with Alduin ourselves, here and now." Gormlaith: "We shall see soon enough. Alduin approaches!" Gormlaith: "Let those that watch from Sovngarde envy us this day!" Alduin: "Nivahriin joorre! What have you done? What twisted Words have you created?! Tahrodiis Paarthurnax! My teeth to his neck! But first... dir ko maar. You will die in terror, knowing your final fate... To feed my power when I come for you in Sovngarde!" Gormlaith: "If I die today, it will not be in terror. You feel fear for the first time, worm. I see it in your eyes. Skyrim will be free!" Hakon: "No, damn you! It's no use! Use the Scroll, Felldir! Now!" Felldir: "Hold, Alduin on the Wing! Sister Hawk, grant us your sacred breath to make this contract heard! Begone, World-Eater! By words with older bones than your own we break your perch on this age and send you out! You are banished! Alduin, we shout you out from all our endings unto the last!" 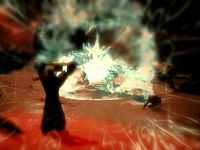 Hakon: "It worked... you did it..."
Felldir: "Yes, the World-Eater is gone... may the spirits have mercy on our souls." 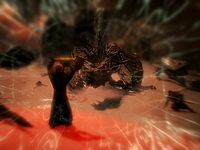 Directly after the cutscene, when you arrive back in the present, Alduin will appear at the Throat of the World, shouting: "Bahloki nahkip sillesejoor. My belly is full of the souls of your fellow mortals, Dovahkiin. Die now and await your fate in Sovngarde!" Paarthurnax will then interfere, saying: "Lost funt. You are too late, Alduin! Dovahkiin! Use Dragonrend, if you know it!" Alduin battles Paarthurnax at the Throat of the World. Paarthurnax and Alduin will take flight, attacking each other in the air. 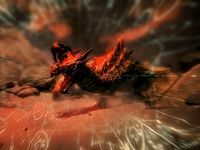 Paarthurnax tells you to use your Dragonrend shout if you can, and indeed, when the chance arises, use Dragonrend on Alduin, forcing him to the ground. It can be rather difficult distinguishing between the two dragons if the battle is done at night or while it is snowing. The quest arrow on your compass always points to Alduin, so use that to distinguish between them. During the battle, Alduin may say some of the following taunts: "Dovahkiin, you call yourself? Arrogant mortal. ", "Bahloki nahkip sillesejoor. ", "I will feast on your soul in Sovngarde! ", "You are no match for me, joor! ", "Paarthurnax is weak. I am strong. ", "My time has come again. ", "Maar saraan ko Sovngarde. ", "I have feasted on many greater than you. ", or "You will pay for your defiance!" When Alduin is grounded, he may say: "My teeth to your neck, Dovahkiin!" When he is grounded, you must attack him as much as you can before he takes flight again. This may take a few tries, since he has a huge health pool and does reasonable damage. Be wary of Alduin's "Dragon Storm Call" shout, which causes fiery meteors to rain from the sky, causing both fire and physical damage. Note that Clear Skies will cancel the meteor shower, and has such a short recharge time that it won't interfere with using Dragonrend on him. 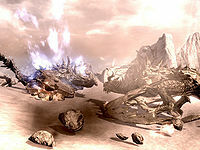 In particular, using Dragonrend immediately when it recharges will keep Alduin grounded for the whole fight. When Alduin's health drops to zero, he says: "Meyz mul, Dovahkiin. You have become strong. But I am Al-du-in, Firstborn of Akatosh! Mulaagi zok lot! I cannot be slain here, by you or anyone else! You cannot prevail against me. I will outlast you... mortal!" He will then fly off, completing the quest. It is not possible to harm Alduin while he's in the air. He is immune to all forms of damage except when he's under the Dragonrend shout effect (i.e. grounded). 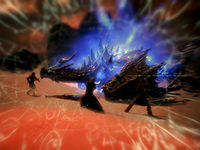 Therefore, you cannot defeat Alduin without using Dragonrend on him, regardless of how powerful your weapons and spells might be. Inadvertently using Dragonrend on Paarthurnax and therefore grounding him often makes Alduin hover in one place in the air while attacking Paarthurnax, thus making it easier to strike him with Dragonrend, although it is better to ground Alduin alone. Alduin may remark "You may have picked up the weapons of my ancient foes, but you are not their equal!" when you use Dragonrend against him. Even after completing this quest, the Elder Scroll will still be marked as a quest item, making it impossible for you to drop it or place it in a container, though it will remain weightless. The only way to remove it from your inventory is to sell it to Urag gro-Shub in the College of Winterhold library, although if you do, and you install the Dawnguard add-on, you will have to buy it back from him for another quest. When you read the Elder Scroll at the Time-Wound, all active blessings (including Voice Of The Sky) will be removed. The only way you can reduce your shout cooldown for the fight with Alduin, therefore, is to wear an Amulet Of Talos, since any Blessing Of Talos you obtain will be removed before the fight begins. During the cutscene Gormlaith, Hakon or Felldir may look at you, as if you were there. Alduin may become invincible during the fight. According to the patch notes, this bug was supposed to have been fixed by version 1.9.26.0.8 of the Skyrim Official Patch. However, there have still been confirmed reports of this bug occurring; specifically, if you exit dialogue with Alduin prematurely after returning from the vision in the Time Wound, or if you die during the fight with Alduin and reload the game. Open the console, click on Alduin, then use the command disable followed by enable. This may result in Alduin being able to be damaged normally. Saving immediately before combat starts, then fast-traveling away and returning, may fix this. As of 1.9.32.0, the game creates an autosave after exiting the Merethic-era cutscene, right before the conversation with Alduin. The cutscene in the Merethic era may not trigger or complete, leaving you stuck there. Doing other quests and then returning may fix this. Another possible fix, after getting stuck in the cutscene, is to open the console and type in setstage mq206 32. This should let you regain control of the camera and a dragon should land, enabling the cutscene to continue. You could also type setstage mq206 70 into the console to learn the Dragonrend shout directly, then type in setstage mq206 100 to end the cutscene and start fighting with Alduin. 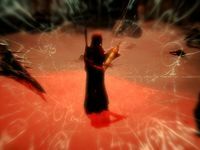 Fixing the stuck cutscene bug may leave you with blurred vision. This can be fixed by using vision altering effects. Examples of these include visiting a new dragon wall and learning a new shout or using the Archery perk Eagle Eye. 10 I've located the Elder Scroll that was used to cast Alduin forward into our time by the Nord heroes of old. If Paarthurnax is right, if I read it near the Time-Wound I will get a vision of the past, when the ancient Nords used the Dragonrend Shout against Alduin. 70 This is a hidden state, used to teach the player the Dragonrend shout. it does not adjust the quest text, status, or objectives, and is only used to award the Dragonrend shout during the Time-Wound cutscene. 100 I read the Elder Scroll near the Time-Wound, and learned the Dragonrend Shout in a vision of the Nord heroes fighting Alduin in the distant past. Now I need to use Dragonrend to defeat Alduin in the present time. 220 Finishes quest I read the Elder Scroll near the Time-Wound, and learned the Dragonrend Shout in a vision of the Nord heroes fighting Alduin in the distant past. When I returned from the vision, Alduin attacked me, and I used Dragonrend to bring him down and defeat him. The following empty quest stages were omitted from the table: 0, 1, 5, 15, 30, 32, 33, 35, 40, 42, 48, 50, 52, 60, 75, 80, 82, 85, 87, 88, 89, 90, 120, 140, 160, 180, 200, 230, 240. On the PC, it is possible to use the console to advance through the quest by entering setstage MQ206 stage, where stage is the number of the stage you wish to complete. It is not possible to un-complete (i.e. go back) quest stages, but it is possible to clear all stages of the quest using resetquest MQ206. This page was last modified on 2 May 2018, at 03:13.